The Christian Faith Church came about as a joint venture between the [[Chortitzer Mennonite Conference|Chortitzer Mennonite Conference]] (CMC) Ministerial Executive and Board of Missions. The first meetings concerning a church plant were held in spring of 2004. Two cell groups were created in [[Steinbach (Manitoba, Canada)|Steinbach]] and [[Winkler (Manitoba, Canada)|Winkler]] to pray over the new church plant vision. By spring 2006, the work began to focus on the Winkler/Morden/Altona/Roland area. After the endorsement of the Conference Ministerial, the Board of Missions, and the [[Zion Mennonite Church (Schanzenfeld, Manitoba, Canada)|Zion Mennonite Church]] (located nearby in Schanzenfeld), Winkler was selected as the site of the church plant. Cornie Martens (pastor) and Cornie Penner (deacon) came on board to lead. Thiessen, Richard D. "Christian Faith Church (Winkler, Manitoba, Canada)." Global Anabaptist Mennonite Encyclopedia Online. July 2010. Web. 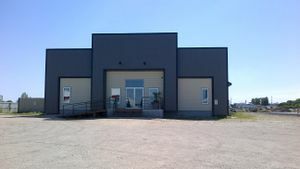 25 Apr 2019. http://gameo.org/index.php?title=Christian_Faith_Church_(Winkler,_Manitoba,_Canada)&oldid=104686. Thiessen, Richard D. (July 2010). Christian Faith Church (Winkler, Manitoba, Canada). Global Anabaptist Mennonite Encyclopedia Online. Retrieved 25 April 2019, from http://gameo.org/index.php?title=Christian_Faith_Church_(Winkler,_Manitoba,_Canada)&oldid=104686.